Last Saturday I took the Megabus coach to London, and the train at Paddington to Bath to attend the fundraiser banquet at the Guildhall to mark the 60th Anniversary of the Conferring of the Freedom of the City of Bath to His Imperial Majesty Emperor Haile Selassie I. The funds being raised are for the Friends of Fairfield House, the organisation that is taking charge of Fairfield Mansion to ensure that it will continue to be used as a home/day centre for the elderly in accordance to the wishes of the Emperor when He donated it to the Council and also as a heritage site for the Rastafarian and Ethiopian people. This is a cause that I feel very passionate about, and continue to call upon Rastafarians all over the world to support as a sacred duty. The banquet was attended by people drawn from all walks of life, bound by that same abiding interest in Fairfield. The organisers were impressed that I had travelled all the way from Middlesbrough. The question invariably was "Is there a substantial Rastafarian community in Middlesbrough?" There isn't, but there ought to be! It would appear that it falls on me to see about this. In fact, it appears to have fallen on me for a very long time to see about this now, but a community has to consist of people rather than just one person. It was a pleasure to see other Rastafarians there. Some brothers from Birmingham. And the venerable Elder Bandele and what I believe is his family. And Shawn Naphtali Sobers, who I have been in touch with for years online and by telephone without actually meeting. Shawn Naphtali, by the way, made the film Footsteps of the Emperor. Some of the other brothers I had hoped to meet at the banquet, such as Robbie Shilliam, had come in during the day and already left. Another time, perhaps. I had the honour of sitting at Steve Nightingale's table, sharing this with the Mayor of Bath herself, Cherri Beath, and Councillor Paul Crossley and his wife and daughter. Paul Crossley is the man who halted the sale of Fairfield House in the wake of the campaign. 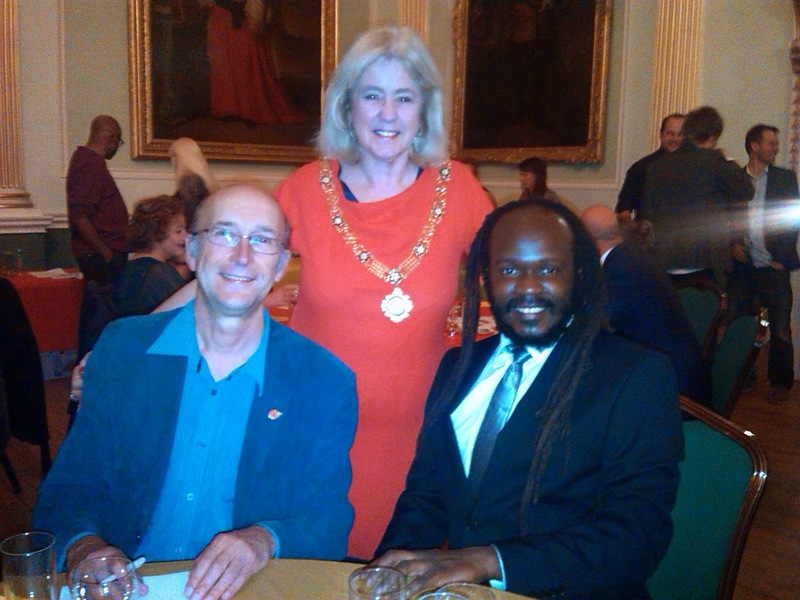 In the picture below, I am attended by the Mayor and Councillor Crossley. I also had occasion to chat with the Deputy Mayor of Bath, Lisa Brett. She has worked in Africa, and took part in London demonstrations against apartheid. We ended up discussing a whole range of issues. All I can I say is that it made me realise that I need to go out more and meet interesting people such as the Deputy Mayor. God-willing, I would like to return to Bath. There is a congregation at Fairfield House itself on the 1st and 2nd of November. I will better organise my journey too. It turns out there is a morning coach from Middlesbrough to Bristol and then from there I can catch a train or bus to Bath. Last Saturday, I had to leave early in order to catch the last train back to London. By then, my phone's battery was flat, so I could not ring up any of the relatives I had lined up to host me for the night. Silly me had only taken a USB cable, which was no good for charging the damn thing on the coach or train. Nor could I check the internet for the best deal in hotels. It was only after a bit of wandering about London that I found an internet cafe that was open and not only charged my phone, but booked a morning coach back to Middlesbrough. I think we are going to see more Rastafarians in Britain take an interest in Fairfield House, judging by the comments on my facebook page. 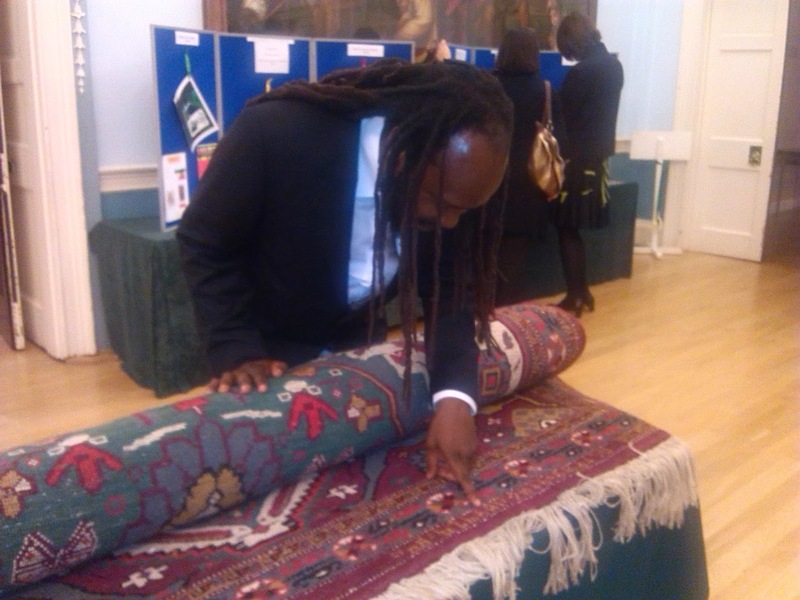 Bath Council is to be commended for recognising the value of Fairfield as a heritage site for the Rastafarian people. I only wish more of our own people did.